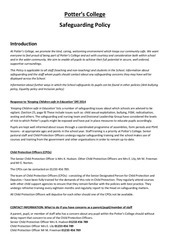 This PDF 1.3 document has been generated by Word / Mac OS X 10.10.5 Quartz PDFContext, and has been sent on pdf-archive.com on 02/01/2016 at 03:27, from IP address 69.161.x.x. 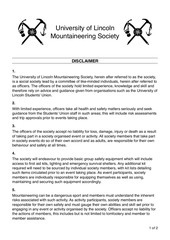 The current document download page has been viewed 324 times. 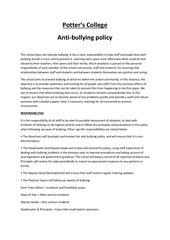 involving students, staff or community member. If ever in doubt, first step is call 911.
immediately contact the Office to report the incident. 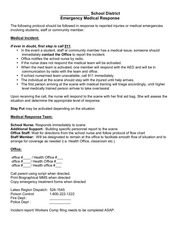 • Office notifies the school nurse by radio. 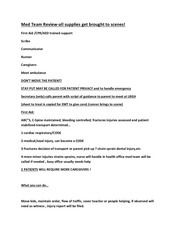 • If the nurse does not respond the medical team will be activated. communication by radio with the team and office. • If school nurse/med team unavailable, call 911 immediately. • The individual at the scene should stay with the injured until help arrives. situation and determine the appropriate level of response. Call parent using script when directed. Incident report/ Workers Comp filing needs to be completed ASAP. Teacher contacts office with emergency situation. 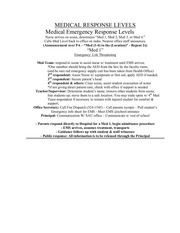 Medical Response Team activated by office. Principal: Determines need for “Medical Lockdown”. Communication with SAU office. This file has been shared by a user of PDF Archive. Document ID: 00328697.